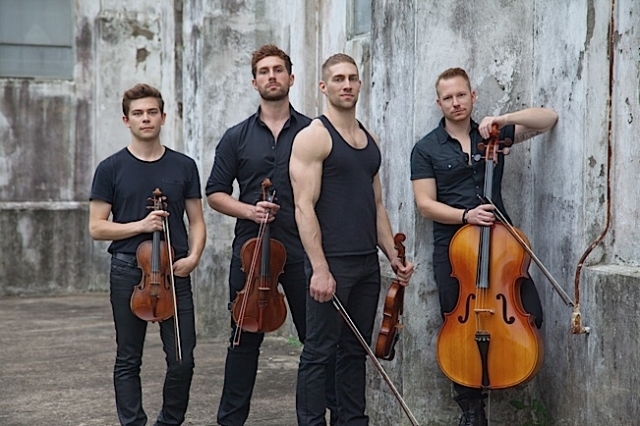 If there’s one evening in April to keep open, it’s April 10th when the rising stars—and adorable hunks—of the string quartet Well-Strung perform at the Illusion Theater as the highlight of a fundraiser for Call for Justice, LLC. Maybe you’ve never heard of Well-Strung. If that’s the case, this will be your chance to see and hear something incredibly unique—the classical music of Mozart and Vivaldi mixed with the pop of Kelly Clarkson and Lady Gaga. Yes, that’s different. But it works all so well. I stumbled onto Well-Strung last September on what was the final performance of their summer-long run in Provincetown on Cape Cod. I knew nothing about the group, but their moniker was enough reason to ante up for a ticket. What followed was a performance that kept me grinning for an hour and wanting to share the experience with my friends back home in the Twin Cities. As good as their music is, “the boys” aren’t bad on the eyes, either. My sweet dears Edmund (Bagnell), Chris (Marchant), Daniel (Shevlin) and Trevor (Wadleigh) are buff and built; their bows aren’t the only things that flex when they play. If it sounds like I’m swooning, it’s because I am. This will be Well-Strung’s Minneapolis premiere. We’re catching them on the upswing, too—the quartet recently completed a European tour where they were hailed as “absolutely amazing” by BBC Radio host Jo Good after their on-air performance. More recently, the quartet appeared on the Today Show. They’re booking out months in advance and crisscrossing the country as they build upon a reputation for superb music and delightful audience banter. In case that’s not enough incentive, Well-Strung’s visit to Minneapolis is for a good cause. Call for Justice, LLC, a small Twin Cities nonprofit that works to connect low-income people with legal resources, is hosting the group for its first-ever fundraiser. Each year, tens of thousands of people—mothers trying to protect their children, families wanting safe apartments, persons fleeing abusive relationships—find themselves in need of legal assistance. All too often, there are too few resources to help. Call for Justice (“C4J”) helps make the legal system more responsive. It does this in part by creating collaborations which connect people with lawyers. Thus, C4J was instrumental in helping two Minneapolis law firms “adopt” the Jeremiah Program, which works to end intergenerational poverty in women and children. C4J also trains United Way 2-1-1 Information and Referral on how to make better targeted legal referrals. YouTube views of those training videos (available to anyone at www.callforjustice.org) just surpassed the 15,000 mark (that’s a 1,234% increase in views in the last seven months). So why not listen to some great music, view some wonderful musicians, and do some good in the world? Circle April 10 on your calendar. Doors at the Illusion open at 6 p.m. for cocktails (cash bar); seating for the program will begin at 6:45.